Success is a combination of habits and secrets and if you get what I am about to share with you, it will change your life. There is a law known to bible scholars as the law of first mention, it simply states that the first time something was mentioned in the bible was the original purpose for which it was written. The first time Adam saw Eve, he said to her "this is now bone of my bones and flesh of my flesh she shall be called woman because she was taken out of man" Now if women were taken out of men it means that originally man had a woman in him but imagine if God had to create grown up men and began to put them to sleep to remove their ribs so He can create women, it would be a long process. I am convinced God removed a rib from every man to form a woman. Your wife is a female version of you, that's why the first time you saw her you just knew that she was the one, nothing could explain it; you just knew! The bible also says that God brought the woman to Adam, have you ever thought about how you met your spouse? Of all the millions of people in the world your paths crossed! That in itself is a miracle! Ladies and gentlemen I said all of the above to explain to you that you and your spouse are ONE. 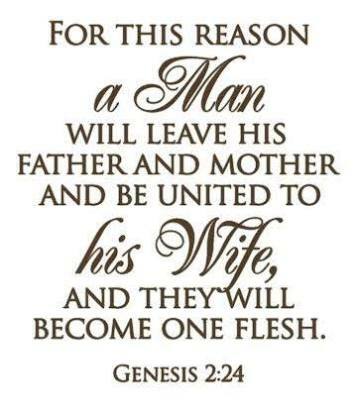 The bible says in other words when a man finds the bone of his bone and flesh of his flesh, he LEAVES his father and mother (who were custodians until that point) and unites with his wife and they become ONE flesh! Not two separate people, ONE flesh! This is how God sees it! So if you are cheating and mistreating your husband/ wife you are actually hurting yourself! When you love your wife/ husband you love yourself when you hate your spouse you hate yourself. Both of you are one whatever good or bad you do in that marriage is for you! This is why those who are faithful and who do good in marriage will always win! You are a fool if you think you are hurting your husband or wife with all the nonsense you do, you are hurting yourself! May God open our eyes in Jesus name. You too can be a social media evangelist. Please share so that others can be blessed as you have been blessed.